As you can see, this "Masterpiece Edition" is very shiny. 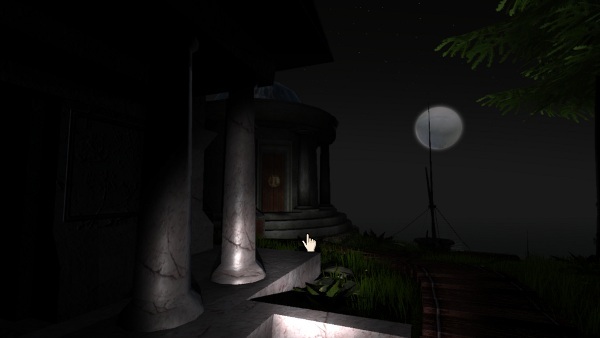 I don't have the original (2000-ish) RealMyst around to take comparison screenshots, but you can internets it. Anyhow. 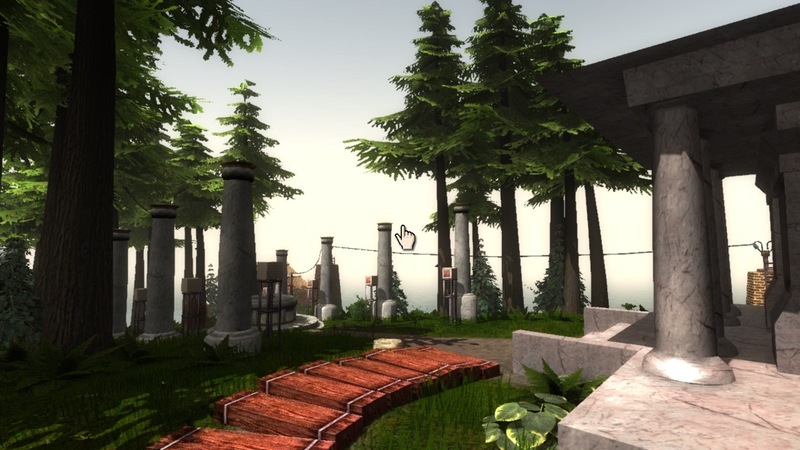 The new RealMyst has nicer textures, a bit more model detail, and some lighting effects such as bloom and dynamic shadows. Most blatantly, it has a lot more sun/moon/clouds environmental shifting. All the Ages (I think) have a day-night shift, which cycles in real time as you play. Sunset on Myst Island was terrific. Oh, and you have a flashlight. Hit F to switch it on and off. I don't know whether they added the flashlight because the night-phase is so dark, or if they deliberately dropped the ambient lighting to make the flashlight more fun. It works pretty well, anyhow. I'm somewhat less happy with the interface. It's WASD keyboard control, with mouse-look active if you hold down the right button or if you're walking. (It took me a good long time to figure out that you don't have to hold down the right button while you walk.) When you're standing still, the mouse moves the cursor around instead. (As well as the flashlight beam.) 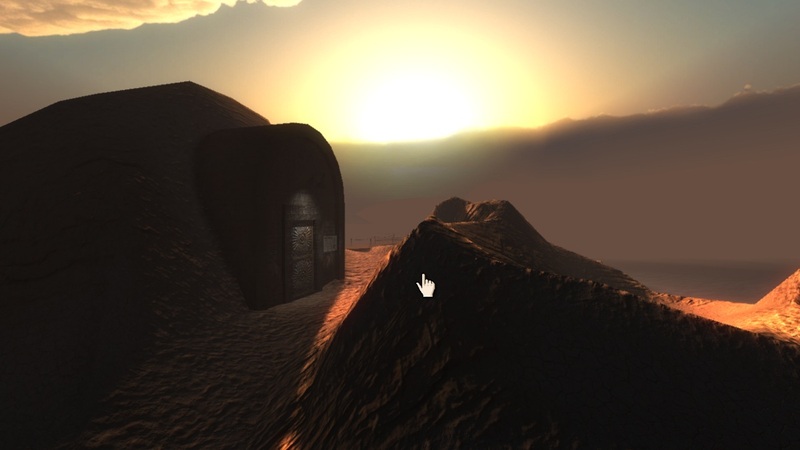 Click and drag on things in the usual Myst style. Maybe I'm over-familiar with the Uru control setup, but this feels really awkward. Something about the mode-switch -- right button versus walking -- is hard to get used to. I flail trying to look around, and then I navigate tight corridors like a long barge rowed by short mammoths. I dunno. I didn't have this problem with the iPad version. If it's really unbearable, you can switch back to original-Myst-style node-and-hotspot navigation. But is there anybody left in the universe who wants node-and-hotspot navigation, except as a workaround for clumsy 3D UI? Anyhow. This post is just an excuse to post the shiny screenshots, and I've done that, so you're on your own now. Eighteen US bucks. Followup: The problem some users are seeing is that the escape key fails to bring up the menu. This makes it impossible to adjust any settings or quit the game. I (and several friends I've asked about the topic in a hopefully non-leading manner) prefer node-and-hotspot navigation. On mouse-or-touchscreen devices, it seems the most natural option. While I've played enough games over the last couple decades for WASD to be second-nature, it feels fundamentally at odds with the pace of an exploration game. 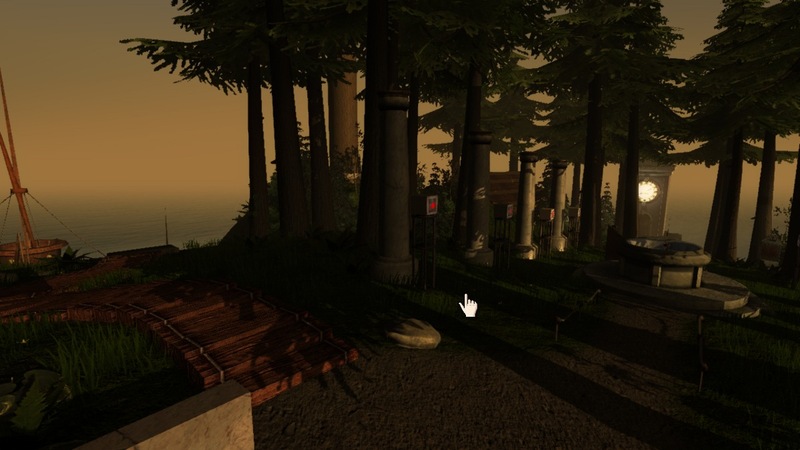 As long as I'm being pedantic: it turns out that Myst and Channelwood have day/night cycles; Myst also gets clouds sometimes. Stoneship is an eternal storm. In Mechanical the sun moves around the sky, and goes behind clouds, but never sets. Selenitic appears to have a fixed environment. Same for Rime, except for the artificial variations which I will not spoil here.